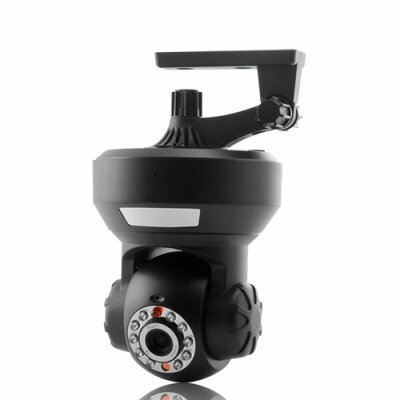 Successfully Added Wireless IP Camera with Micro SD Card Recording (H.264, IR Cut-Off Filter, Nightvision, Motion Detection) to your Shopping Cart. Wireless IP Camera with Micro SD Card Recording: The ultimate security camera that comes with H.264, IR filter, nightvision, motion detection, and finally, video recording onto external memory. Store countless hours of video files directly on a micro SD card up to 16GB (not included) with cycled recording mode and make sure to keep a track of all suspicious activity at your home or office. Once the card is full, it will automatically overwrite on previous recorded files so there is no worry to miss out any unforeseen event! Whether you're at an airport or a coffee shop, or you’re in Hong Kong, Paris, London, Barcelona, California, Moscow etc, you’ll be able to check the security status of your home or business from any computer in the world that has an internet connection. The Wi-Fi feature on this global security camera with motion detection recording comes with a CMOS sensor for providing you with a high quality image for over the web viewing and supports common network protocols.